Silver is a chemical element with the chemical symbol Ag (Greek: άργυρος árguros, Latin: argentum, both from the Indo-European root *arg- for "grey" or "shining") and atomic number 47. A soft, white, lustrous transition metal, it possesses the highest electrical conductivity of any element and the highest thermal conductivity of any metal. The metal occurs naturally in its pure, free form (native silver), as an alloy with gold and other metals, and in minerals such as argentite and chlorargyrite. Most silver is produced as a byproduct of copper, gold, lead, and zinc refining. Silver has long been valued as a precious metal, used in currency coins, to make ornaments, jewelry, high-value tableware and utensils (hence the term silverware) and as an investment in the forms of coins and bullion. Silver is my metal of choice, I love the colour, it is easy to work with not as expensive as gold but still has the whole precious thing going for it and it takes patinas well. 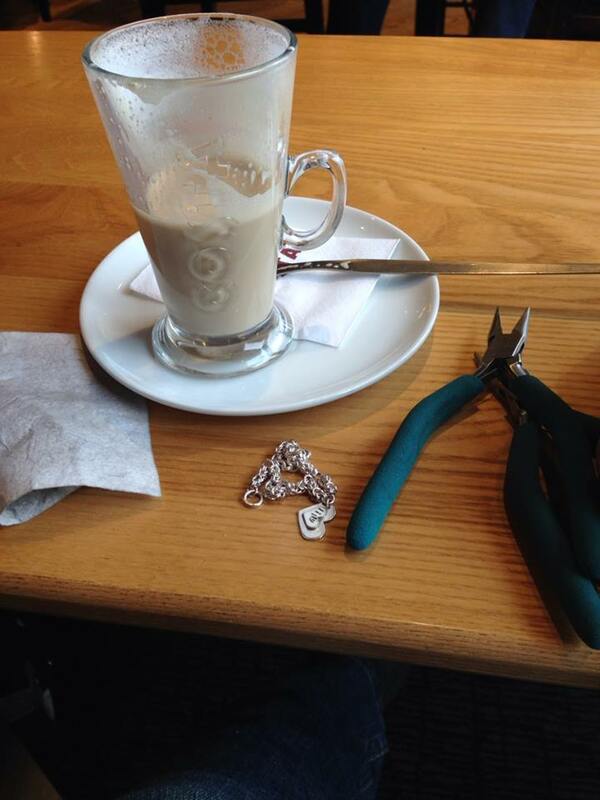 And because every post needs a picture here is what I got up to a few days ago, kids at school baby having a nap so I headed to the coffee shop to sit and make some jewellery over a vanilla latte (still trying to be less of a hermit)!